AOC announces the Q3279VWFD8, a sibling to the 31.5” Q3279VWF, a superb allrounder from the well-received 79 series, which debuted last autumn and received huge appraisal for its extraordinary price/performance ratio. The new monitor, Q3279VWFD8 uses a different panel type - IPS - rather than the VA panel used in its older brother and boasts a wider colour gamut for increased colour accuracy and therefore more vivid, natural and eye-catching imagery. The Q3279VWFD8’s 31.5” IPS panel offers a QHD resolution (2560x1440 pixels) resolution, 5ms G2G response time, AMD FreeSync support and a slightly boosted 75 Hz refresh rate. Aimed at particularly budget conscious home power users, internet cafés and everyone who is after jaw-dropping specs without breaking the bank are going to be well-served with the Q3279VWFD8. In other specs the IPS panel offers a 1200:1 contrast ratio, 250 cd/m2 brightness, 178/178 viewing angles, 8-bit+FRC colour depth and 88% NTSC colour gamut (a bit beyond the typical 72% coverage that corresponds to sRGB). The Q3279VWFD8 offers a wide range of connectivity, including legacy sources such as VGA and DVI as well as HDMI 1.4 an DisplayPort 1.2, therefore is capable of connecting various game consoles, PCs, laptops, set-top boxes and many more. A 3.5mm jack connector is foreseen to connect headphones or an external speaker set. The 31.5” Q3279VWFD8 will be available from July 2018 with an MSRP of £219. Leading NEC’s new MultiSync displays is its flagship PA271Q model, designed for professional office and creative workers. This is a 27" sized screen with an IPS panel and 2560 x 1440 resolution. "With superior colour management and outstanding ergonomic features, the PA271Q provides industry-leading colour reproduction thanks to its SpectraView Engine and integrated colour calibration application. For long-term calibration accuracy the display provides an integrated calibration sensor and supports an external sensor. No need for an extra host-based calibration application - simply connect the external sensor to the display’s USB port and administrate your desired calibration target in the on-screen menu." This allows direct hardware calibration for the monitors 14-bit 3D LUT. The screen has a wide gamut GB-r-LED backlight with 100% sRGB and 99% Adobe RGB colour space coverage and a 10-bit colour depth as well. In other specs there is an 8ms G2G response time, 1500:1 contrast ratio, 350 cd/m2 brightness, 178/178 viewing angles and 60Hz refresh rate. The screen offers USB type-C connectivity to help de-clutter your desk and manage video, audio, power and USB through a single cable. There is also a DisplayPort input and output (for daisy chaining), 1x Mini DisplayPort and 2x HDMI connections provided. There is also an integrated 3 up/2 down USB 3.1 hub. Users can also benefit from perfect uniformity across multi-screen setups with just one click in the display’s on-screen menu which is a useful feature in high end professional grade screens. The stand offers a full range of tilt, height, swivel and rotate functions as well and there are 2x 1W integrated speakers, and a headphone jack provided for sound. 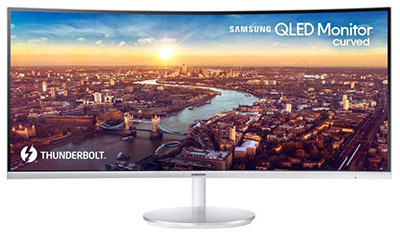 Samsung have recently announced a new 43" sized model in their CJ89 range, the C43J89. 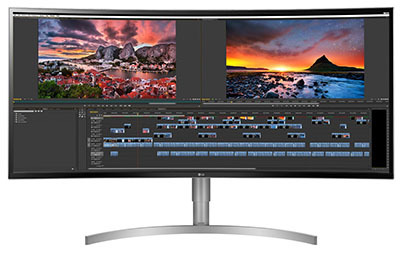 This screens offers an ultrawide format with 32:10 aspect ratio and delivers a 3840 x 1200 resolution. This essentially gives the same viewable area as two 24:10 aspect ratio 1920 x 1200 res screens side by side, but from one larger single display. The C43J89 has a 1800R curvature for a more immersive and comfortable viewing experience given the large size. Of particular interest is the support on this screen for a 120Hz refresh rate, although no variable refresh rate technology (G-sync or FreeSync) appears to be supported. In other specs the VA panel offers a 5ms G2G response time, 3000:1 contrast ratio, 300 cd/m2 brightness, 178/178 viewing angles, 8-bit colour depth and a standard sRGB gamut. Tilt, height and swivel adjustments are offered from the stand and there are HDMI 2.0, DisplayPort 1.2, 2x USB type-C, a 3.5mm headphone jack and 3x USB 3.0 ports offers for connectivity. There are also integrated 2x 5W stereo speakers offered. The C43J89 is available to pre-order in the USA at around $900 and should be available soon. Asus have recently released the information and specs for their new ROG Strix XG248Q gaming display. This is a 23.8" sized monitor with a 1920 x 1080 resolution TN Film panel and 240Hz native refresh rate. To date we've only seen 240Hz screens in 24.5" and 27" sizes, so this is a new offering from Asus for a slightly smaller screen size. The XG248Q offers a 1ms G2G response time and support for Adaptive Sync (including AMD FreeSync) as well. Asus have even added their additional ELMB (Extreme Low Motion Blur) strobing backlight system for motion blur reduction benefits. In other specs the screen offers a 1000:1 contrast ratio, 400 cd/m2 brightness, 16.7m colour depth, sRGB gamut and 170/160 viewing angles. ROG Strix XG Series gaming monitors feature ASUS Aura Sync lighting on the back and a customizable light signature projection for gaming-inspired aesthetics. There are a range of gaming extras in the OSD menu as well like crosshairs, FPS counter etc. 2x HDMI 2.0, 1x DisplayPort 1.2 and 1x HDMI 1.4 connections are offered. There are also 2x USB 3.0 ports and a headphone jack. 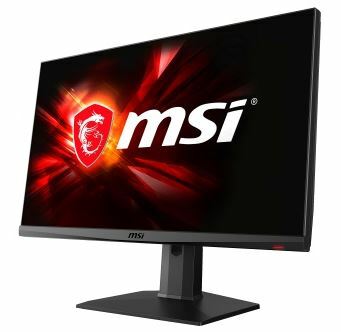 MSI are pretty new to the monitor market but seem to be making a decent effort to release interesting gamer-oriented options at affordable prices. First up is their new 49" ultrawide screen showcased at Computex this week - the Optix MAG491C. This screen is 49" in size and has a 32:9 aspect ratio VA technology panel and a 3840 x 1080 resolution like other available and announced 49" models we've seen so far from the likes of Samsung and Asus. The MSI model has a 3ms G2G response time, 144Hz native refresh rate and support for AMD FreeSync. In other specs a 3000:1 contrast ratio, 400 cd/m2 brightness and 100% sRGB colour space are noted. Picture by Picture is supported for split-screen, multi-input viewing. 3x HDMI and 1x DisplayPort connections are provided according to reports from Computex. The MAG491C is due out later this year at an expected price of $999 USD. Secondly there is the new 24.5" sized Oculux NXG251 gaming display. This model is based on a TN Film panel and offers a 1920 x 1080 resolution and 240Hz refresh rate. A 0.5ms G2G response time spec is given, although it remains to be seen whether there's any real improvement in practice compared with currently 1ms G2G generation gaming screens. NVIDIA G-sync is supported as well for variable refresh rates. We expect this to be using one of AU Optronics's most recent TN Film panels where they have actively pushed response times down to the new 0.5ms levels. Comments from visitors and journalists at Computex were very positive about this screens colour rendering and even viewing angles, so it looks like there may be some improvements offered there which would be very welcome. The NXG251 is expected around Q4 this year at a price of $599 USD. 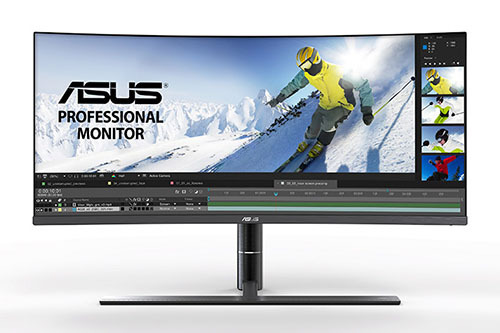 From the Asus press release: "For creative professionals like video editors and photographers, your monitor cannot be an afterthought. It’s not just the canvas that displays your work, but also a vital tool for doing your work. For many privateers and prosumers who work from home, the same screen serves up games and entertainment at the end of the day. The ASUS ProArt PA34V mixes work and play on a gorgeous ultra-wide curve. It delivers the colour accuracy required for media-intensive projects and is loaded with useful features and technologies that help you be more productive and efficient. With support for Adaptive-Sync and refresh rates up to 100Hz, it also enables a much more fluid gaming experience than conventional displays." The PA34VC is 34" in size with a 21:9 ultrawide aspect ratio and a 1900R curvature. A full 3440 x 1440 resolution is offered. It's based on an IPS technology panel and offers a standard sRGB colour gamut. Adaptive Sync (FreeSync) supports a refresh rate from 40 all the way up to the native 100Hz of the screen. The screen is factory calibrated to ensure reliable colours, with a dE of <2 offered. The screen also supports hardware calibration of the monitors internal LUT. The ProArt Calibration Technology lets you save colour profiles directly to the monitor itself instead of relying on your PC. This is a useful feature that helps ensure consistent colours no matter which devices are connected to the display. . PA34VC also comes with 95% uniformity compensation to guard against brightness and chroma (colour) fluctuations on different parts of the screen. Picture-in-Picture mode gives you a small window on the display that lets you keep an eye on a secondary input source; you can move this window between the corners of the display depending on where you need it. Picture-by-Picture (PbP) mode is more powerful, because you can view content from up to four different sources simultaneously, each one confined to its own portion of the display. There are 2x Thunderbolt 3 USB type-C, 2x HDMI 2.0 and 1x DisplayPort 1.2 connections offered on this display. Both DP and HDMI can support Adaptive Sync by the way, so you can also benefit from that technology for console gaming if you have a suitable device. Two Thunderbolt 3 ports add tremendous flexibility; via reversible USB Type-C connectors, they support peak bandwidth up to 40Gbps, which is plenty of throughput to work with content on external storage devices. Because you can daisy-chain Thunderbolt 3 hardware , you can use one of the ProArt’s ports to plug in a string of up to six storage devices. Meanwhile, you can use a laptop to drive the display with the other TB3 port, while also charging the laptop with 60W of power delivery. By enabling several simultaneous display inputs and loading up on powerful ports like Thunderbolt 3, we put more control at your fingertips. To view and manage content from multiple sources, you need only one keyboard, one mouse, and one ProArt PA34VC. 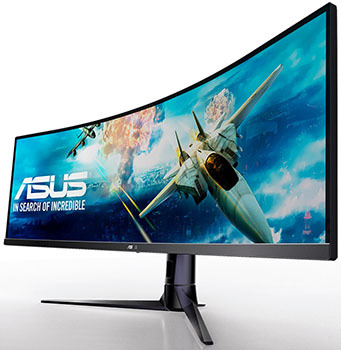 Showcased this week at Computex was the forthcoming AsusVG49V, a 49" sized mega-wide, 32:9 aspect ratio, curved (1800R) display designed for both gaming and general multi-tasking uses. The screen is based on a VA technology panel and offers a 3840 x 1080 resolution. This is double the width of a normal 1920 x 1080 display, and is referred to as "Double Full HD" (DFHD) as a result. For multitasking on multiple devices, the VG49V’s Picture-by-Picture mode lets you view input from two separate sources simultaneously. Anyone who’s used a powerful desktop PC for intensive work alongside a laptop to handle day-to-day tasks can attest to how handy it is to be able to easily see both on the same screen at once. Devices connect via the VG49V’s DisplayPort 1.2 and dual HDMI 2.0 inputs. For gaming purposes the screen offers a native 144Hz refresh rate, and supports Adaptive Sync (AMD FreeSync) for variable refresh rates in a range between 48 - 144Hz. The panel supports a 4ms G2G rated response time and Asus have even added their ELMB (Extreme Low Motion Blur) strobing backlight for reduced motion blur in gaming, and a 1ms MPRT specification. ELMB works at 85, 100 or 120Hz according to the Asus press material (without FreeSync). Asus' 'GameFast' technology helps minimize input lag between your PC and the monitor, heightening your connection to the game and providing a competitive edge in multiplayer matches. In internal testing, Asus say they measured the VG49V’s input lag at just 11.9 milliseconds - we like this new transparency from Asus on input lag figures. Assuming they are accurate and can be trusted (impendent third party testing will tell), it's something we'd love to see more of from other manufacturers. There are 2x HDMI 2.0 and 1x DisplayPort 1.2 connections offered along with 2x 5W integrated stereo speakers and an audio output jack. Availability is expected "towards the end of 2018" according to Asus. No word on pricing yet. 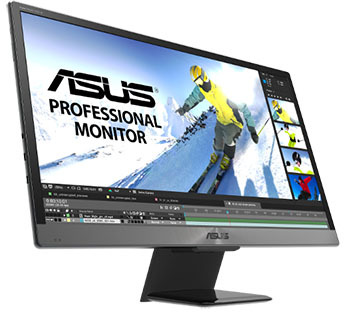 Showcased at this week's Computex event in Taipai was the forthcoming CG32 monitor from Asus. It is aimed at console gamers in bedrooms, gaming dens and playrooms where there is perhaps not the size for a huge TV or display, and is 31.5" in size. The 4K 3840 x 2160 Ultra HD resolution is high enough to handle Enhanced Xbox and PlayStation games. 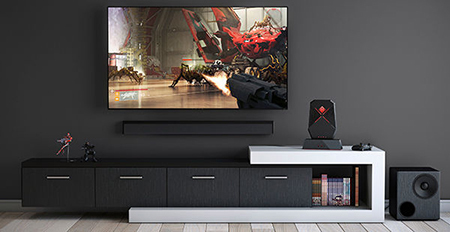 Adaptive Sync and HDR support further enhance gaming and entertainment across different platforms, while Halo Sync lighting adds reactive ambiance that extends beyond the boundaries of the display. The Asus CG32’s VA-type panel supports HDR10 and carries the VESA DisplayHDR 600 certification. It boasts 10-bit colour depth (unclear if that is with 8-bit+FRC or not), and covers 95% of the DCI-P3 colour space, which is a much wider range of colours than sRGB. There is a multi zone-based local dimming backlight (not a FALD and unclear on number of zones at this time), which enables vast dynamic range from deep blacks to bright whites that push up to 600 cd/m² of localized luminance. Variable refresh technology has delighted PC gamers for a few years now, and console gamers are starting to experience the same joy as their preferred platforms roll out similar support. This more cooperative approach to frame delivery matches the refresh rate of the monitor with the frame rate of compatible graphics cards and consoles. Synchronizing these components eliminates visual tearing that cuts across the screen. It also minimizes stuttering when performance drops below the maximum refresh rate, a frequent occurrence when gaming at 4K on all but the most powerful desktops. The CG32 can vary its refresh rate from 40-60Hz to compensate for normal in-game performance fluctuations. Adaptive-Sync works with not only the DisplayPort 1.2 input, but also all three HDMI 2.0 ports, so you can enjoy the benefits across a complete collection of gaming machines including consoles connected over HDMI (where supported by the console). Asus also talk about a 13ms lag which they say is better than most TV's in the market which are more commonly 27 - 50ms. The Halo Sync lighting splays coloured ambiance across your walls. A total of 38 addressable RGB LED's are embedded into the back of the frame. Whenever you’re playing a game, watching a movie, or even sitting at the Windows desktop, Halo Sync matches the LED colours with what’s happening along the borders of the screen. The synchronized glow extends immersion into your room with your own private light show. 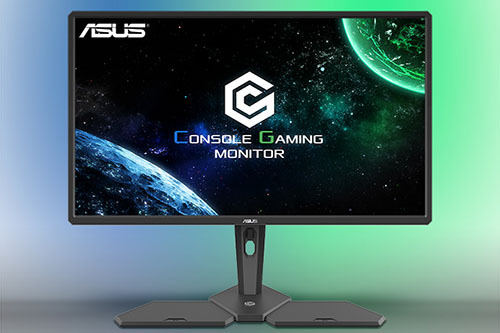 The display technology present in the Asus CG32 is certainly ideal for console gamers, but when we designed this monitor, Asus understood that the physical setup for PC and console gamers is fundamentally different. PC gamers sit close to the monitor and generally have their mouse and keyboard wired to their systems at all times, whereas console gaming is a lean-back experience that predominantly uses wireless gamepads that need to be charged. If you’re sitting at your desk and want to adjust something on your monitor’s OSD, you simply reach out and punch a few buttons. To give you the same easy control while reclining in your beanbag chair or sitting across the room on the couch, they include a remote that can adjust the brightness, change inputs, and perform other OSD functions without forcing you to struggle to your feet and traipse across a room. The monitor also functions as a peripheral and charging hub with four USB 3.0 ports on its base. Two are reserved for charging, so you can keep your gamepads juiced up or plug in your phone if it’s running low on battery, and the other two are downstream ports that let you connect peripherals and external storage devices to one of your systems. A pair of integrated 5W speakers supplies audio right out of the box, and you can connect standalone speakers or a headset if you so desire. Wall mounting is supported via a standard VESA-compatible bracket. If you choose to hang the ASUS CG32, you can still use the base as a hub. Simply connect a charging cable from the monitor to the base, and all of the USB ports are there for you to use. 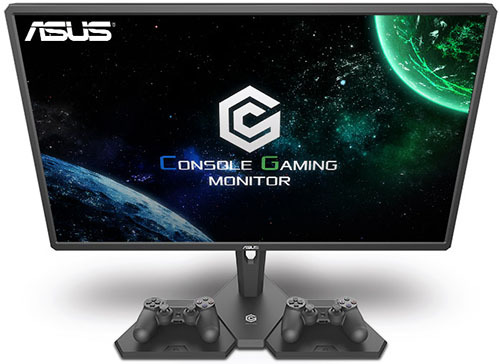 he CG32 console gaming monitor will be available later this year. Pricing to be confirmed. We have some updates from AU Optronics about their panel development plans over the coming year or so. AU Optronics are one of the largest panel manufacturers in the market, and produce various panel technologies including their IPS-type AHVA technology, VA-type AMVA and TN Film variants. Looking ahead at their panel production plans gives a nice indication of where monitors are likely to go in the future by looking ahead at the panel production plans. Please keep in mind that the production dates are not set in stone and may change, and there is then also a lag of several months before a panel is used in a display and launched to market. We have updated our panel parts database with all the new information we have as well. AU Optronics already develop several TN Film gaming panels with a native 240Hz refresh rate, available in 24.5" and 27" sizes and used in various monitors already. These panels have been limited so far to 1920 x 1080 resolution at 240Hz, but AUO now have plans to extend that in the future. Of most interest is a planned new 27" TN Film panel with the same 240Hz refresh rate, but with a QHD 2560 x 1440 resolution. This panel is expected to go in to production in July 2018 and will also offer a 3ms response time (ISO figure without overdrive, down from the typical 5ms limit for TN Film), 400 cd/m2 brightness and even an extended gamut offering 90% DCI-P3 coverage. That 3ms response time spec is AUO pushing the overall responsiveness of the panel, and they rate that as being able to offer <1ms G2G response times with overdrive used, and in fact their target is achieving 0.5ms. Updates to the already available 24.5" and 27" panels are also planned, pushing the response time performance a little bit and offering the new 3ms ISO response time spec. Those panels are sticking with largely the same spec as before including the FHD 1920 x 1080 resolution, 400 cd/m2 brightness and sRGB gamut. The 24.5" update is planed for August 2018 production, while the 27" update is planned for Q4 2018 some time. 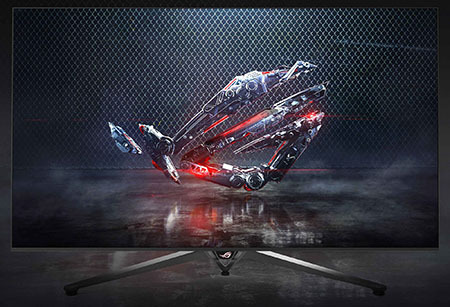 No doubt you're all familiar with the very eagerly anticipated 27" Ultra HD, 144Hz, IPS-type, HDR panel from AUO that will be featured in forthcoming monitors like the Asus ROG Swift PG27UQ and Acer Predator X27. The latest info we have from AUO confirms that this panel should now be in mass production which is good news. Release of the monitors could still be a couple of months away though but positive that panel production is now ongoing. AUO also plan to release a non-HDR version of a similar panel with mass production planned for June 2018. That alternative option would offer an Ultra HD 3840 x 2160 resolution AHVA IPS-type panel, 144Hz refresh rate, 90% DCI-P3 coverage and 400 cd/m2 brightness. Without the HDR FALD backlight, that will hopefully significantly bring the retail cost of monitors down. There's been a lot of complaints about the expected very high retail price of the Asus/Acer monitors mentioned above, but that is largely due to the FALD HDR backlight production. If you just want an Ultra HD 144Hz IPS gaming panel without the added HDR capability, this forthcoming panel option might present some good, lower cost choices when it is used. We have known about the 35" VA offering from AUO for some time now. This will be the panel to feature in exciting HDR models like the Asus ROG Swift PG35VQ and Acer Predator X35. It will feature a 3440 x 1440 curved panel with a 512-zone FALD HDR backlight. Spec wise the panel will support 200Hz refresh rate, 90% DCI-P3 coverage and 600 cd/m2 brightness (1000 cd/m2 peak brightness for HDR). The update from AUO is that mass production of this panel is due now in July 2018 so don't expect to see any of these monitors until probably Q3. Of other interest are some planned new 43" sized panels based on VA technology. This will be a new panel sector for AUO as sizes for gaming displays start to grow and grow. There are two 43" panels planned with very similar specs. Both offer Ultra HD 3840 x 2160 resolution, are a flat format instead of curved, have 400 cd/m2 brightness and 90% DCI-P3 colour gamut. There is a 60Hz version planned as well as a 144Hz version. Both are expected to go in to production around August 2018. Finally is a very large format 65" VA panel in a flat format and looks very interesting from a spec point of view. This panel is expected to go in to production in September 2018 and will have a 3840 x 2160 Ultra HD resolution, 144Hz refresh rate, 700 cd/m2 brightness, 1000 cd/m2 peak brightness for HDR and 95% DCI-P3 colour gamut. It will have a 384 zone FALD backlight to support HDR content. There's a general push to increase the colour space offered from the professional-range panels over the next few years from AUO. They hope to offer 99% Adobe RGB and 90% DCI-P3 colour space from their panels in 2018, pushing this to 99% DCI-P3 next year in 2019 and then even further towards a 90% Rec.2020 coverage by 2020. There are already some 27" and 32" panels in mass production for professional uses, and these are based on AHVA (IPS-type) technology, offering 3840 x 2160 resolution, 60Hz refresh rate, 99% Adobe RGB gamut and 8-bit+FRC colour depth. An updated 32" panel is planned for around January 2019 production which will offer similar space, but push 90% DCI-P3 coverage and offer VESA HDR 600 support. There are also plans to develop further HDR-capable panels with a new "mini LED" technology that will offer improvements in HDR local dimming capability over current Full Array Local Dimming (FALD) backlights. Mini LED offers much smaller chip sizes than normal LED and so can allow AUO to offer far more local dimming zones than even the current/planned FALD backlights that we've seen so far. Those FALD backlights have been limited to around 384 dimming zones on already announced 27" and 32" sized panels that are in production, certainly offering improvements in dimming capability compared with say, edge-lit panels. The new mini LED backlight systems will support more than 1000 zones on a planned 32" panel, that's expected to go in to production in Q1 2019. They are a long way away, and that date could well slip, but it's interesting to see what's coming around the corner with mini LED backlights. Considering the production cost of Mini LED is still relatively high, AUO will first launch the Mini LED-lit gaming monitor, according to Michael Tsai, President and Chief Operating Officer at AUO. The company expects customers in the gaming monitor segment to have a higher price tolerance it is said from recent press releases. In the future, expect to see even smaller "micro LED" production to offer even more zones and direct backlighting for HDR displays. There are no dates or expectations from AUO on the use of micro LED yet though. The planned 32" panel with mini LED will be an AHVA (IPS-type) technology panel and will offer an Ultra HD 3840 x 2160 resolution, 600 cd/m2 brightness (1000 cd/m2 peak), 10-bit colour depth, 99% Adobe RGB gamut and will have two refresh rate options - a 60Hz version and even a planned 144Hz version (with 8-bit colour depth on the 144Hz option we believe). We have some updates from LG.Display about their panel development plans which is always interesting to see. This is LG.Display as a panel manufacturer, as opposed to LG the monitor/display manufacturer, but it gives an indication of where monitors are likely to go in the future by looking ahead at the panel production plans. LG.Display make a large portion of the IPS-type panels in the market which is always of interest. Please keep in mind that the production dates are not set in stone and may change, and there is then also a lag of several months before a panel is used in a display and launched to market. We have updated our panel parts database with all the new information we have as well. HDR is obviously a very popular topic right now in the monitor space and it's clearly a big focus from panel manufacturers and monitor vendors alike. We've seen recently the new VESA HDR standards introduced to try and provide some kind of certification for desktop monitors, and a continued investment in pushing new options to deliver HDR performance for users in various situations, whether that's gaming, movies or content creation. Read our detailed HDR article for a lot more information. 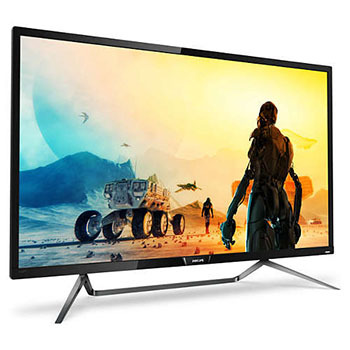 In the 31.5" space LG.Display already have the LM315WR1 IPS technology panel available, featuring a 3840 x 2160 resolution, 1300:1 contrast ratio, 350 cd/m2 brightness and sRGB gamut. There is also an option available currently for this panel to offer a level of HDR support. There is a version with an edge-lit local dimming backlight, peak 550 cd/m2 brightness (350 cd/m2 typical for SDR) and 95% DCI-P3 gamut. There is also a slightly updated version planned for production around June 2018 which will offer VESA HDR 400 compliance, boosting the typical brightness offered from 350 to 400 cd/m2. The other HDR specs remain the same as the existing version. Beyond this, LG.Display are also planning to launch the 31.5" LM315WR2 IPS panel, with production started in April 2018. This will offer VESA HDR 600 support instead, with a 3840 x 2160 resolution, 450 cd/m2 brightness (750 cd/m2 peak brightness), 1300:1 contrast ratio, 98% DCI-P3 gamut. In the smaller 27" space the forthcoming LM270WR7 IPS panel will offer a 3840 x 2160 resolution and support for VESA HDR 600. This includes a 450 cd/m2 brightness (750 cd/m2 peak brightness), 1300:1 contrast ratio, 98% DCI-P3 gamut. This 27" panel is not expected to go in to production until Q1 2019 though. A new 34" IPS panel, the LM340RW1 is also planned for production in May 2018 with VESA HDR 600 support. This panel offers a high 5120 x 2160 resolution, 450 cd/m2 brightness (750 cd/m2 peak) and 98% DCI-P3 coverage. Linked to the drive for HDR panels is the new "IPS Nano" technology from LG.Display. According to the early LG.Display press material: "Nano IPS technology involves the application of nanometer-sized particles to the screen’s LED to absorb excess light wavelengths. This greatly enhances the intensity and purity of on-screen colours for a more accurate and life-like viewing experience." This is an equivalent solution to competitor Quantum Dot solutions. QD typically involves applying a coating to the panel to enhance the colour gamut. This Nano IPS solution instead enhances the backlight to boost that colour space. This is also referred to as "KSF LED" where KSF is the chemical compound used to treat the backlight and extend the colour space. LG.Display talk in their recent material about how Nano IPS panels will offer 98% DCI-P3 coverage which is a little more than common competing 95% coverage of Quantum Dot solutions. This corresponds to 135% sRGB instead of 125%. Look out for various screens emerging with Nano IPS promoted as a feature and the corresponding wider DCI-P3 colour gamut coverage. Quite a few of the panels mentioned in this news piece will feature the Nano IPS panels with 98% DCI-P3 coverage. Look out for where the 98% DCI-P3 coverage is mentioned. This includes panels in sizes of 31.5" with 3840 x 2160 resolution (production April 2018), 34" (3440 x 1440 in May and 5120 x 2160 in June 2018) early this year. There will be followed by additional 27" and 31.5" (both with 2560 x 1440 res) sized panels in December 2018. There is also a 37.5" panel with 3840 x 1600 res planned for March 2018. The next step for colour space development beyond this will be a 20" panel capable of offering wide BT.2020 colour gamut, thanks to the use of a new "CF and LED" solution. That panel is not expected until 2019 sometime. For gaming there are some exciting developments as well for high refresh rate IPS panels. The 31.5" LM315WQ1 is expected to go in to production in December 2018 and will offer a 2560 x 1440 resolution with 165Hz refresh rate. This panel also offers a 1000:1 contrast ratio, 350 cd/m2 brightness and 98% DCi-P3 gamut thanks to the Nano IPS panel. In the 27" space is the forthcoming LM270WQA panel, with a 2560 x 1440 resolution and 165Hz refresh rate. This also offers a 1000:1 contrast ratio, 350 cd/m2 brightness, sRGB gamut. It's not expected to go in to production until December 2018. In the 34" ultrawide space there is already a 3440 x 1440 resolution @ 100Hz IPS LM340UW4 panel available and used in some displays. There are plans to produce the LM340UW5 from May 2018 which will offer the same resolution but a boosted 144Hz refresh rate. This will be combined with NVIDIA G-sync and also VESA HDR 400 support. This will then offer a 1900R curvature, 400 cd/m2 brightness (550 cd/m2 peak), 1000:1 contrast ratio and 98% DCI-P3 coverage. There is also talk from LG.Display about improvements in their IPS response times, reportedly trying to improve on the current 5ms G2G, pushing down down to 1ms G2G with higher levels of overdrive. It remains to be seen how successful this is in practice, and how much overshoot gets introduced but an investment in driving response times to accommodate higher refresh rates properly is certainly welcome. There's also a push to develop more ultrawide format screens, in sizes from 34" all the way up to 49" - to rival what Samsung are also currently doing with their VA panels. At the largest end is the LM490DQ1 49" IPS panel. This is a 32:9 aspect ratio and will offer a very high 5120 x 1440 resolution (DQHD) along with a 3800R curvature, 1000:1 contrast ratio, sRGB gamut and 350 cd/m2 brightness. This is due to go in to production around September 2018. In the 37.5" space there's already an existing LM375QW1 option from LG.Display with a 3840 x 1600 resolution and 60Hz refresh rate (often overclocked to 75Hz). In Q1 2019 (March current ETA) there are plans to release a new LM375QW2 which will offer the same resolution but a higher 144Hz refresh rate. This panel will also be VESA HDR 1000 compliant, with a 2300R curvature, 98% DCI-P3 gamut, 5ms response time and 4-side borderless design. It's not specified how the VESA HDR 1000 is achieved but we would expect some kind of FALD backlight to achieve those kind of specs. There are also plans for a 34" ultrawide with 3440 x 1440 resolution, HDR 400 compliance, 144Hz refresh rate and a 1900R curvature. Planned for production from May 2018. This is an interesting one, but LG.Display also talk about how currently users buy separate speakers because built in monitor speakers are generally fairly poor quality. Their new Crystal Sound Display (CSD) technology will offer front-firing sound through the full screen area, seemingly building the sound output in to / behind the panel itself. It's an interesting concept. The first offering will be a 34" ultrawide panel for gaming, offering a 3440 x 1440 resolution, 3-side borderless design and thin profile. Specs for the CSD include 200 - 20,000Hz frequency and "75dB sound pressure @ 50cm" as they have it labelled. Production of this new CSD enabled panel is expected Q4 2018 at the moment. We have some updates from Samsung about their panel development plans which is always interesting to see. This is about Samsung as a panel manufacturer, as opposed to Samsung as a monitor manufacturer but it gives an indication of where monitors are likely to go in the future. Samsung are primarily focused on their VA-type technology (SVA) and TN Film. Please keep in mind that the production dates are not set in stone and may change, and there is then also a lag of several months before a panel is used in a display and launched to market. We have updated our panel parts database with all the new information we have as well. Samsung are focusing their development on three key areas: Ultrawide format displays are becoming increasingly popular and they will continue to invest in not only the more common 16:9 and 21:9 format, but also in 18.5:9 and 32:9 aspect ratio displays. This will be coupled with a push towards more curved panels and typical sizes will be 34", 43.4" and 49". Secondly through the use of Quantum Dot technology they plan to boost the colour gamut of their panels beyond typical sRGB and towards higher DCI-P3 coverage. Thirdly, for gaming applications there is a push to provide more high refresh rate panels of 100Hz and higher. Of particular interest is a new 49" sized VA panel scheduled for production around September 2018. Samsung already have a 49" VA panel available which boasts a 3840 x 1080 resolution (DFHD = dual full HD resolution) and 144Hz refresh rate. The new panel will offer a higher 5120 x 1440 resolution (DQHD = Dual quad HD resolution) and will have the same 3-side frameless design, 1800R curvature and support for 120Hz refresh rate. Slightly lower refresh rate but a much higher resolution. Their 43.4" segment will also feature a new VA panel that'd due to go in to production around the same time in September 2018. This will offer a 3840 x 1200 resolution (DWUXGA), have a 3-side frameless design, 1800R curvature and support 144Hz refresh rate. In the 34" space there is already a widely used 3440 x 1440 @ 100Hz VA panel available, featured in several monitors already. Samsung plan to offer a 144Hz refresh rate version of this panel later on, with production planned for Q3 2018 at the moment. Around July 2018 Samsung will also start to produce a 31.5" curved VA panel with 3840 x 2160 Ultra HD resolution. This panel will offer a 3000:1 contrast ratio, sRGB colour space and 120Hz refresh rate. This last weekend, Philips announced the first screen in their new 'Momentum' line-up, the 436M6VBPAB. The new model is a large 43" sized display (42.51" to be precise), designed for console gaming and offering a range of features typically found in the desktop monitor space, but not normally available for TV's which would traditionally be used for such uses. There's not really many screens around which are aimed specifically at this space, and so it's an interesting looking option for users who want a decent display for console gaming. Requirements from console gamers are increasing, and that's where this screen aims to fit in. The 436M6 has a full Ultra HD 3840 x 2160 resolution and is based on an MVA panel which we believe will be manufactured by TPV who are linked to the Philips brand. The VA panel will offer the deep blacks, high static contrast ratio (4000:1) and wide viewing angles (178/178) common to this technology. The screen has an award-winning design, which looks quite a lot like a TV, and includes a black glossy plastic bezel and rear, with a thin aluminium stand. This does also include a tilt function which isn't often found from TV stands. No height or swivel adjustments are offered though. For gaming needs the screen has a few tricks up its sleeve including an advertised 4ms G2G response time, support for Adaptive Sync and Philips' low input lag feature. The screen has a maximum 60Hz native refresh rate and while we realise Microsoft have recently announced an update for X-box to support higher refresh rates in the future, this 60Hz should be adequate for current console gaming needs and most common systems. Microsoft also has support for Adaptive Sync now, and so it's nice to see that feature included here which is not commonly found in the TV market, but has been nicely brought over from the monitor segment for this display. The Adaptive Sync range supported is 48 - 62Hz according to the Philips team, and it will also mean that you can use FreeSync from compatible AMD graphics cards if you are connecting a PC as well. According to the press material, the low input lag mode helps reduce the lag of the screen down from 31ms (fairly typical for a TV set) down to 21ms. A range of SmartResponse overdrive controls are available in the OSD menu to help optimise the pixel response times. This screen will also be the first to market apparently with the recent Display HDR 1000 certification and also carries the UHDA certification for an HDR display. This means it can offer a 1000 cd/m2 peak brightness for HDR content (720 cd/m2 listed as the normal 'typical' brightness), has support for 10-bit colour depth (8-bit+FRC) and a wide colour gamut covering 97.6% DCI-P3. We spoke to the product manager who confirmed that 32-zone edge-lit local dimming is used to support the HDR here. The wide colour gamut is achieved through a combination of Philips Wide Color Gamut backlighting (where chemicals are used to enhance the LED backlight) and Quantum Dot film coating. The screen has a decent range of interface options with DisplayPort 1.2, Mini DisplayPort 1.2, HDMI 2.0 and USB 3.1 Type-C offered. There are also 2x USB 3.0 ports integrated in to the screen with fast charging support, along with an audio input and headphone output. Philips have also added an additional "Ambiglow" lighting system to the screen which shines a glow from the bottom edge of the display on to the surface. There are also 2x 7W stereo speakers with DTS sound built in, and the display even comes with its own remote control so that it can be treated more like a TV when it comes to console gaming - or if you want to hook up other devices like TV boxes, Blu-ray players etc. Picture in Picture (PiP) and Picture by Picture (PbP) are both supported as well. When positioning why the 436M6 is better than a TV for console gaming, Philips say that it is because it can offer various features which offer better performance than most competing alternatives - lower input lag, smoother gameplay thanks to Adaptive Sync, faster response times and a more immersive overall experience through the Ambiglow lighting. The display will retail in Europe for 799 Euro with first small batches of stock expected in May, followed by a wider availability in June. This is the first model in the new 'Momentum' line-up so expect to see some other size offerings at some point in the future too. Release is expected at a similar time in the USA and elsewhere also. The screen has started to appear on some regional Philips.com websites already for more info and specs. We know from the original press release material and also Asus' website what to expect from the key specs and features. As a reminder, the PG27UQ is a 27" screen with an IPS-type panel from AU Optronics (M270QAN02.2 AHVA technology). It features a 3840 x 2160 Ultra HD resolution and will be the first panel of its kind to pair that "4K" resolution with a 144Hz native refresh rate. 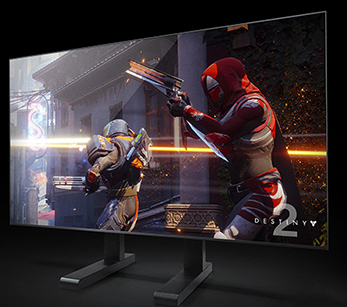 Not only that, but the screen has been produced in conjunction with NVIDIA as part of their "G-sync HDR" range, and will feature a high end 384-zone Full Array Local Dimming (FALD) backlight for optimal LCD HDR performance. Apparently Asus have added an option to the OSD menu to control the speed of the FALD operation which could be useful, especially since early FALD adoption such as that on the Dell UP2718Q was pretty slow - and probably not suitable for fast 144Hz gaming. It remains to be seen of course how fast the FALD can operate, but this is likely to be a key consideration for this as a viable HDR gaming display. It's also likely to be one of the causes for the long delay we believe. Quantum Dot screen coating then provides a boost to the colour gamut of the screen, allowing it to extend beyond the typical sRGB and achieve >90% DCI-P3 (125% sRGB coverage). An Asus rep has confirmed that the 1.07b colour depth is (not surprisingly) achieved through an 8-bit+FRC panel. Not that this will really make much real difference in practice for the target uses. This high bandwidth requirement is supported through the latest DisplayPort 1.4 interface. HDMI 2.0 is also provided for console connectivity although that will be limited to 60Hz for those devices. An Asus rep has confirmed that 4K HDR consoles like the PS4 Pro and X-box One X will support HDR @ 4K on this screen over HDMI as well. This has been frequently pushed back as it was originally expected to arrive in Q3 2017 based on a panel mass production date of July 2017 from AU Optronics. Several delays to panel production have meant that the date has slipped on several occasions. The latest information we have obtained from sources in the UK is that the screen is expected now around Q3 2018, something that our friends over at Blurbusters have also confirmed with sources in the USA. More recently NVIDIA started to tell some reporters that they firmly expected a release before the end of April, although we don't put a massive amount of faith in that personally as it's not NVIDIA who are ultimately producing, releasing and selling this Asus screen (or equivalents from Acer and AOC). At the end of March an Asus representative posted in the ROG forums that they expected production would start in May. A rather adventurous "mid/late May or early June" was then forecast. We would be very pleasantly surprised to be wrong about this, but we still feel that a Q3 release is most realistic right now, certainly for any mass market, high availability of the screen. We will update this news item if we receive any more information. We won't speculate on price too much as this is still to be finalised, but there has been talk of the screen being anywhere between $2000 and $3000 USD, or equivalent Euro/GBP pricing. Update 11/5/18 - April has come and gone and NVIDIA's "promise" of release before the end of the month has come to nothing, perhaps not surprisingly. From very recent information we have received we know that the AUO panel for this display is now in mass production. That's a good sign, as should mean no further panel delays although it could still be a couple of months before we see availability of the monitors. More information as we get it. The Asus Aura Sync (to sync with other Aura Sync enabled components and peripherals), ROG Light Signal (to project a logo on to the wall/ceiling) and Light Signature projection kit (to project on to the desktop area) "let gamers create fun an immersive lighting effects for a customised gaming atmosphere"
There is 1x DisplayPort 1.4 and 1x HDMI 2.0 interfaces offered along with 2x USB 3.0 ports and a headphone jack. Update 7/6/18 - We've started to see some of the competing Acer Predator X27 screens "in the wild" now, as stock has arrived in the USA region so far. The Asus PG27UQ hasn't yet appeared but is expected imminently in USA. In the UK and Europe we are expecting it to be available right at the end of June, and some websites have started to take pre-orders already. We are hoping to get a sample of the Asus screen a little before the release, but probably not until very late June. We will bring you a full review as soon as possible. 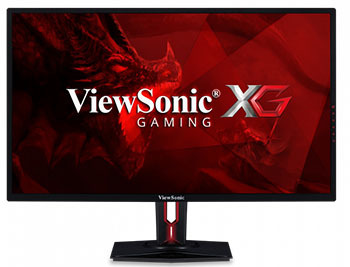 ViewSonic have just announced a new 31.5" screen in their XG gaming series. The XG3220 features a VA technology panel from Innolux (AAS = Azimuthal Anchoring Switch in fact) and offers a 3840 x 2160 Ultra HD resolution, 5ms G2G response time, 3000:1 contrast ratio, 300 cd/m2 brightness, 178/178 viewing angles, 8-bit+FRC colour depth and a wide 95% NTSC colour gamut (sRGB is approx 72% NTSC). FreeSync support is offered with a variable refresh rate range of between 40 and 60Hz. HDR10 support is mentioned in the spec, although there's no talk of any form of local dimming being used, or any improved peak brightness and so we expect HDR performance to be very limited. It can probably support HDR content as an input, but not offer anything really in terms of true HDR experience as an output (other than the extended colour gamut). There is a full range of tilt, height, swivel and rotate adjustments offered from the stand. For connectivity there are 2x HDMI 2.0 and DisplayPort 1.2a available, along with a 3.5mm headphone hack and 2x USB 3.0 ports. 2x 5W stereo speakers are also provided. 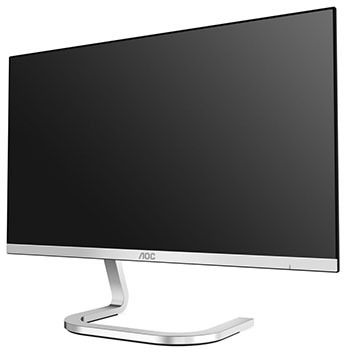 Only recently did AOC announce their new X24P1 display with a 23.8" screen size and fairly rare 1920 x 1200 resolution (16:10 aspect ratio). BenQ have also recently launched a similar screen, their SW240 with a 24.1" sized screen and that same 1920 x 1200 resolution. It is based on an IPS technology panel and is focused on colour accuracy. This model sports a wide gamut backlight and comes with factory calibrated (dE <3) sRGB and Adobe RGB preset modes. 99% Adobe RGB, 100% sRGB and 95% DCI-P3 colour gamut coverage is specified. It also has a hardware calibration feature for its 14-bit 3D LUT and has a 1.07b colour depth support. In other specs the IPS panel offers a 5ms G2G response time, 1000:1 contrast ratio, 250 cd/m2 brightness, 178/178 viewing angles and 60Hz refresh rate. A full range of tilt, height, swivel and rotate adjustments are offered by the stand. There are DVI, HDMI 1.4 and DisplayPort 1.2 connections offered along with a 3.5mm headphone jack. The screen even has an integrated SD card reader along with 2x USB 3.1 ports. An optional shading hood (SH240) is available to help minimise glare. The screen is expected to be released before the end of May at a retail price of <£400 GBP. 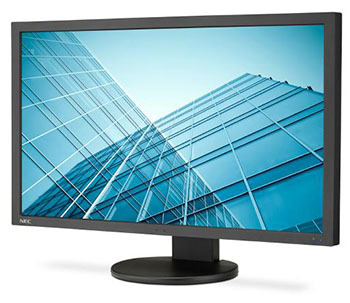 Eizo have recently released their new CG319X display, a 31.1" sized display with a full 4K 4096 x 2160 resolution. It is designed for HDR video editing and colour accurate photo work. The ColorEdge CG319X is equipped with HLG (hybrid log-gamma) and the PQ (perceptual quantization) curve for displaying and editing HDR (high dynamic range) video content. The optimized gamma curves render images to appear more true to how the human eye perceives the real world compared to SDR (standard dynamic range). This ensures professional creators can reliably display HDR content for editing and colour grading. Oddly there is no mention of any form of local dimming or FALD backlight on this model, nor any specs for an increased "peak brightness". This wide-gamut monitor faithfully reproduces 98% of the DCI-P3 standard used in digital cinema and supports the Rec. 2020 standard used in broadcasting. In addition, it covers 99% of the Adobe RGB colour space so images shot in Adobe RGB will be displayed correctly. The wide colour gamut also ensures reproduction of almost the entire ISO-coated and US web-coated CMYK colour spaces used in printing. In compliance with the DCI standard, the ColorEdge CG319X offers a high contrast ratio of 1500:1 for producing true blacks that are otherwise difficult to display on a typical LCD monitor. When viewing the screen from an angle in a dimly lit room, dark tones typically appear washed out due to the display characteristics of LCD backlights. The CG Series is equipped with a retardation film which allows tones to retain their depth even when viewed from an angle. This looks like it will be like an A-TW polarizer film which is great news. Spec wise the 31.1" sized screen uses an IPS technology panel and offers a 4096 x 2160 resolution, 9ms G2G response time, 1500:1 contrast ratio, 350 cd/m2 brightness and 178/178 viewing angles. The CG319X features a built-in calibration sensor to help hardware calibrate the screens 24-bit 3D LUT and schedule measurements. The panel supports a 10-bit colour depth itself. A digital uniformity correction function is also provided to improve uniformity of the display. The screen comes with a full range of ergonomic adjustments with tilt, height and swivel offered. There is a provided shading hood as well. The ColorEdge CG319X is equipped with two DisplayPort and two HDMI inputs. It supports various video formats of up to 10-bit 4:4:4 at 50/60p via DisplayPort and 10-bit 4:2:2 at 50/60p via HDMI. A 3-port USB 3.0 hub is also provided. AOC have recently announced a fairly rare screen size and resolution which is likely to interest some buyers. The X24P1 uses a 24" range screen (actually 23.8" in size) and features a 1920 x 1200 resolution (16:10 aspect ratio) instead of the far more common 1920 x 1080 (16:9). This gives users a little bit more vertical space to work with, and while it might not be as suitable for multimedia uses, some people do prefer it for more general office/photo type work. The X24P1 is based on an IPS technology panel and offers a 4ms G2G response time, 60Hz refresh rate, 1000:1 contrast ratio, 250 cd/m2 brightness, 178/178 viewing angles, 16.7m colour depth and standard sRGB gamut. There is a full range of tilt, height, swivel and rotate adjustments offered by the stand. The screen has DisplayPort, HDMI, VGA, 4x USB 3.1 and a headphone jack included for connectivity. There are integrated speakers provided as well. The screen is scheduled for June 2018 availability in the UK and Europe with an MSRP of £249. Designed for the "performance-conscious business user" and focused on viewing comfort and smart ergonomics, Philips have recently announced the release of the 27" 272B8QJEB display. The screen offers a 2560 x 1440 resolution IPS technology panel, 5ms G2G response time, 1000:1 contrast ratio, 250 cd/m2 brightness, 17/178 viewing angles and a standard sRGB gamut. It supports Adaptive Sync as well although it's not widely promoted on their spec pages or press release. There is a 10-bit colour depth supported along with 12-bit internal processing to offer a larger colour depth and smoother gradients. There are VGA, DL-DVI, DisplayPort 1.2 and HDMI connections offered along with integrated USB 3.0 ports. There are also 2x 2W integrated speakers along with a headphone jack. The new 272B8QJEB display combines the paper-like reading experience of EasyRead Mode with the great flexibility of its SmartErgoBase, a special monitor base designed to simplify the adjustment of the display's height, swivel, tilt and rotation angle to suit any individual preference and ergonomic need. Low blue light modes and a flicker free backlight operation are also key as part of the viewing comfort focus. Philips 272B8QJEB, with an RRP of £239, will be available in March 2018. 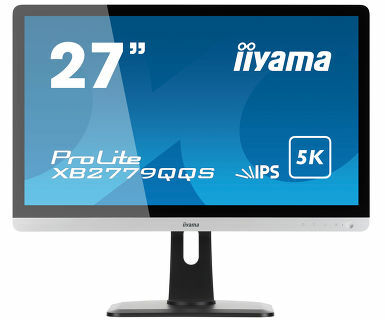 Iiyama have recently released a new 27" model in their ProLite range of screens. The XB2779QQS features an IPS technology panel with a 5K 5120 x 2880 resolution. Of interest is the edge-to-edge glass finish as well which will provide a glossy screen coating to this monitor, something pretty rare in the market nowadays. In other specs the screens offers a 4ms G2G response time, 1200:1 contrast ratio, 440 cd/m2 brightness, 178/178 viewing angles, 16.7m colour depth (interestingly listed as 6-bit+FRC in Iiyama's specs) and 60Hz refresh rate. FreeSync is also listed in the specs although not heavily promoted on the Iiyama website. There are 2x DisplayPort 1.4 interfaces available which will support the full 5120 x 2880 resolution at 60Hz refresh rate. 3 additional HDMI interfaces will support up to Ultra HD 3840 x 2160 resolution @ 60Hz. 2x 2.5W stereo speakers are provided along with a headphone out port. The stand offers tilt, height and swivel adjustments. Actually launched last Spring (2017) but not given much coverage at the time (sorry! ), the PDS series from AOC offers a unique design, thanks to its exceptional appearance conceptualised jointly with the famous design house Studio F. A. Porsche. The 24” PDS241 and the 27” PDS271 have the slimmest profile ever at 5.2 mm, even thinner than most smartphones. There is a 3-side frameless design to the panel and a unique curved "twisted metal" stand. Both screens offer a 1920 x 1080 resolution IPS panel, 4ms G2G response time, 1000:1 contrast ratio, 250 cd/m2 brightness, 16.7m colour depth, 178/178 viewing angles and 60Hz refresh rate. The spec talks about a 100% sRGB colour gamut, but also then mentions wide gamut support with a 90% NTSC coverage. A single HDMI 1.4 connection is provided along with a headphone out port. Only tilt adjustment is offered by the stand. The LG38WK95C has recently been announced, featuring a large 37.5" sized screen with a 24:10 aspect ratio IPS panel. This offers a 3840 x 1600 resolution, giving it a bit more space than a typical 34 - 35" screen vertically. AMD FreeSync is supported for variable refresh rates although the maximum refresh rate is only 75Hz on this screen thanks to a small overclock of the 60Hz native refresh rate like on previous screens this size from LG such as the 38UC99. Dynamic Action Sync (a low input lag mode) and Black Stabilizer settings are also provided to enhance gaming experience. The screen offers a 5ms G2G response time, 1000:1 contrast ratio, 300 cd/m2 brightness, 178/178 viewing angles, 8-bit+FRC colour depth, 99% sRGB. DisplayPort 1.2a, HDMI 2.0, USB type-C, 2x USB 3.0 and a headphone jack are provided for connectivity. 2x 10W 'Rich Bass' speakers are integrated in to the screen as well. HDR10 is promoted in the specs although with only a normal sRGB gamut mentioned, no higher peak brightness spec (300 cd/m2 normal brightness) and no reference to any kind of local dimming support it seems that this is not anything meaningful on this model. The screen retails for $1499.99 in the US and is expected to be available soon. 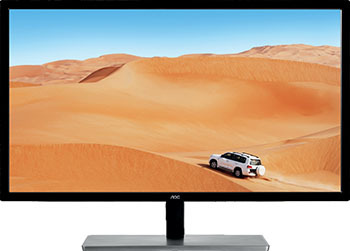 AOC have recently announced a new 35" screen in their popular AG gaming series of screens. The AG352UCG6 Black Edition features a 3440 x 1440 resolution and a 120Hz refresh rate VA technology panel. NVIDIA G-sync is supported and the screen comes with a range of gaming extras including a headphone holder, range of gaming preset modes and AOC Shadow Control settings. The AG352UCG6 has a 1800R curvature and offers a 4ms G2G response time, 2500:1 contrast ratio, 300 cd/m2 brightness, 178/178 viewing angles, 16.7m colour depth and 100% sRGB colour gamut. There are tilt, height and swivel adjustments offered by the stand, and an integrated lighting system on the back of the screen as well which can switch between red, green and blue colours. HDMI 1.4 and DisplayPort 1.2 connections are provided and there are also 2x 2W stereo speakers. 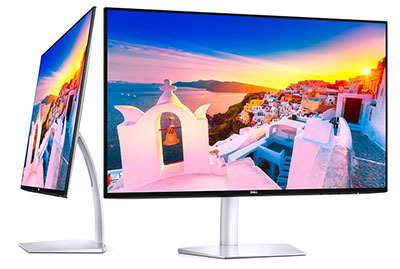 Dell have recently announced a couple of new monitors in their Studio S-line, the S2419HM and S2719DM. Both feature an ultra-thin screen profile, measuring only 29mm at its thickest point, and down to 5.5mm at the thinnest! This is made possible thanks to the use of a Corning Iris™ Glass light-guide plate. There is a borderless design as well to the panel, offering a sleek and attractive overall appearance. The S2419HM is 23.8" in size and sports a 1920 x 1080 resolution IPS panel while the S2719DM has a 27" sized IPS panel with 2560 x 1440 resolution offered. Both have a 5ms G2G response time (fast mode), 60Hz refresh rate, 1000:1 contrast ratio, 400 cd/m2 brightness, 178/178 viewing angles, 8-bit colour depth and 99% sRGB gamut ('greater than' 85% DCI-P3 coverage offered). Both models are promoted as being HDR capable and have a 600 cd/m2 peak brightness for HDR10 content according to the specs. The 27" model is listed as "DisplayHDR 400" compliant as well, although as we've discussed in our HDR article we feel that classification is very loose and doesn't really mean there's anything meaningful in the way of HDR experience. There is a boost from these screens in peak luminance which is good, but apart from that neither screen offers a 10-bit colour depth, Ultra HD resolution or a gamut quite wide enough to deliver a true HDR experience. Also keep in mind that both seem to only offer global backlight dimming, and so no local dimming benefits are available for HDR it seems. The S2419HM is listed on Dell.com at a retail price of $299.99, while the S2719DM is listed at $499.99. Both are available now. Announced in conjunction with NVIDIA, this week at CES 2018 in Las Vegas Asus (image on left), Acer (image on right) and HP (image below) have all showcased their massive new 65" large format displays aimed at PC gaming. Despite the huge size, these new screens are not a TV, they are a computer monitor and will feature support for 120Hz refresh rates and NVIDIA G-sync. This is a true native 120Hz refresh rate, not interpolated like many available LCD TV's and so will support frame rates of up to 120fps. This is then supported by the G-sync function to allow for dynamic variable frame rates. Low input lag is also being promoted as a key feature, which separates these large format displays from most TV screens. 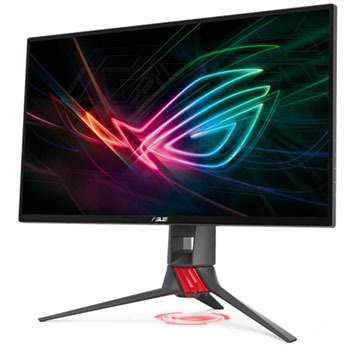 The Asus ROG Swift PG65, Acer Predator BFGD and HP OMEN X65 Big Format Gaming Displays offer an Ultra HD 3840 x 2160 resolution and even supports high-end HDR functionality through the use of a Full Array Local Dimming (FALD) backlight system, with peak brightness of 1000 cd/m2. This HDR feature is supported by the 125% sRGB colour gamut, offering ~90% DCI-P3 coverage thanks to the use of Quantum Dot coating. Users can also enjoy 4K HDR content streaming with the integrated NVIDIA SHIELD, the most advanced streamer with video, gaming, voice control and smart home command capabilities. It remains to be seen whether a screen this large is really practical for users, as it's aimed at PC gaming really and how many people have the desk room for a 65" display, or can sit a comfortable viewing distance of a few meters away for PC gaming? You could have it as a living room display given the size, as it's probably larger than most people's TV screens, although it's unlikely to feature all the integrated TV tuners etc that you might need, and it's probably unlikely again that users will have their PC in the living room to game from. Perhaps this is more of a concept than something which will sell in high volume, although it's certainly interesting as a display option. Pricing and additional details will be released closer to the availability date, which is expected to be later this year. Of exciting note from CES 2018 is the new Asus ProArt PQ22UC display. 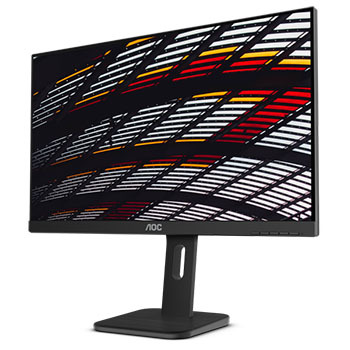 Aimed at professional users and video and photo editing, the PQ22UC will venture in to the World of OLED display technology, something which has barely made a dent in desktop monitors so far. Around a similar time in 2016 Dell announced their 30" UP3017Q display, which featured an OLED panel. This emerged for sale in the US but never made it to Europe and was quite quickly withdrawn from sale. At the moment there are no viable desktop displays using OLED technology. The Asus PQ22UC is something quite interesting then. This model is small by today's standards at only 21.6" diagonal, although perhaps if the concept does well we will start to see larger screen sizes emerge later on. This model features an Ultra HD 3840 x 2160 "4k" resolution (at 206 PPI) and even includes HDR 10 support. This includes a 99% DCI-P3 colour gamut, although peak brightness was not mentioned in the press release. Given it is an OLED panel, expect peak brightness to be in the region of 500 - 600 cd/m2 (now confirmed to be 350 cd/m2), but with the ability to offer very high dynamic range thanks to the super-low black depth that OLED can achieve. The native contrast ratio of the panel is 1,000,000:1 in fact. It is a 10-bit "true RGB stripe OLED panel that produces primary hues natively rather than filtering white light”, Asus say in their press release. It has been factory calibrated to dE < 2 as well and offers hardware calibration support. The screen is also very thin in profile and weighs only 0.9Kg in total, making the screen portable according to the press release. A 0.1ms response time is also mentioned, again another strength of OLED technology. This is not a screen aimed at gamers though keep in mind and we expect it to be limited to a 60Hz refresh rate. So although pixel response times should be nice and low, you are limited by refresh rate when it comes to gaming. The screen is also not expected to include any variable refresh rate technology like G-sync or FreeSync. The monitor offers 2x USB-C and micro HDMI ports. 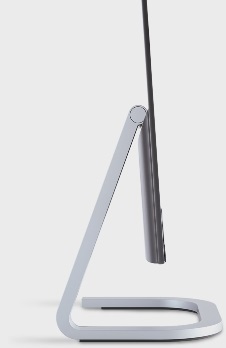 It also has an angled stand that is detachable. The screen is expected to be available around the Spring time, but no word on pricing yet. Update 11/1/18: Correction to the response time spec which is 0.1ms as opposed to 0.01ms. The typical brightness of the screen is 140 cd/m2, with peak brightness of 350 cd/m2. Keep in mind that this is an OLED and high dynamic range will be supported thanks to very low black depth and high static contrast ratios. 2x USB type-C connections are provided along with a micro HDMI 2.0b port. 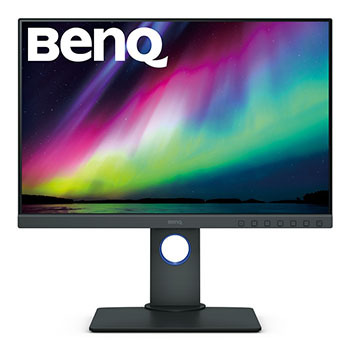 BenQ have recently released a new 27" model in their e-Sports range of gaming screens. 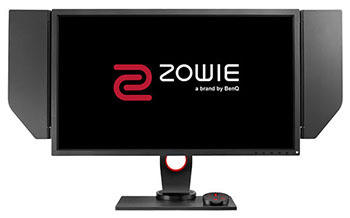 The ZOWIE branded XL2740 is a larger version of the 24.5" XL2540 which has been available for a while now, this time offering a larger 27" screen size. It has the same 240Hz native refresh rate which is the key selling point of this model, for super fast frame rates and great motion clarity benefits. This XL2740 despite being larger, has the same 1920 x 1080 resolution as the XL2540 model, which is a current limitation of providing the super-high 240Hz. This model is also an upgrade to the older XL2720 model, which also featured the same 1080p resolution but had a maximum 144Hz refresh rate. In other specs the TN Film based XL2740 offers a 1ms G2G response time, 1000:1 contrast ratio, 320 cd/m2 brightness, 170/160 viewing angles, 16.7m colour depth and sRGB gamut. Other gaming features include the light shield, familiar black eQualizer settings, loads of game preset modes and an S-switch accessory for quick OSD and setting changes. There is a tilt/height/swivel/pivot adjustable stand, and there are DL-DVI, HDMI 1.4, HDMI 2.0 and DisplayPort 1.2 connections provided for connectivity. HDMI 2.0 or DP 1.2 are needed to run the full 240Hz refresh rate. Headphone and mic jacks are also included along with 2x USB ports. 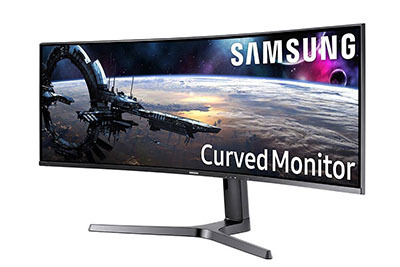 At CES 2018, Samsung Electronics will expand the connectivity and performance capabilities of its signature curved display line-up with the debut of its new CJ791 monitor, the first curved monitor to feature Intel’s Thunderbolt 3 connectivity. Designed for entertainment and business audiences, the 34-inch CJ791 ~(presumably the C34J791) model aligns single-source power and processing speed with an exceptional picture quality for a comfortable and productive user experience. The CJ791 offers a 34" screen size in an ultrawide 21:9 aspect ratio, with a 3440 x 1440 resolution. It comes with a steep 1500R curvature and features Quantum Dot coating to increase the colour gamut to around 125% sRGB. The response time is also mentioned in the press release at 4ms G2G although refresh rate is not mentioned. This will presumably feature one of Samsung's own SVA panels, but we do not know if this will be one of the newer 100Hz panels or just a 60Hz version. The extended colour gamut means that it can offer the colour space coverage for HDR standards, but again there is no mention in the press release of HDR support or corresponding details for peak luminance etc. We do know that the stand provides tilt and height adjustment (no mention of side to side swivel). Full spec and pricing information to follow when we get it, but expect more news during CES 9 - 12th Jan.
Asus have recently added a new 32" sized screen to their ProArt series of displays. 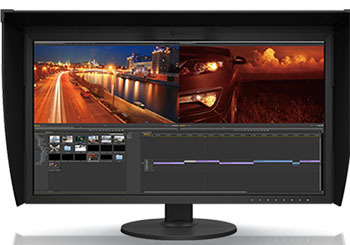 The PA32UC is a professional grade monitor supporting high-end HDR capabilities. This model has a Full Array Local Dimming (FALD) backlight system to deliver optimal local dimming for HDR material, certainly a preference over simpler edge-lit local dimming. Have a read of our detailed HDR article if you want to know more about these techniques and about HDR in general. The FALD backlight offers 384 zones on this 32" screen, and the rest of the spec offers high end HDR experience as well. This includes a 1000 cd/m2 peak brightness, 95% DCI-P3 colour space (85% Rec.2020, 99.5% Adobe RGB, 100% sRGB) and 10-bit colour depth support. Asus even mention "1 micro second operation" (=0.001ms) to show they have tried to ensure fast local dimming, which has become a requirement under the recent DisplayHDR standards introduced by VESA, and something we found slowed down the experience on the FALD equipped Dell UP2718Q when we tested it recently. How this translates back in to actual "lag" of the FALD we don't know yet. The screen comes factory calibrated and hardware calibration is also supported for high end professional calibration and control. In other specs the screen features an Ultra HD 3840 x 2160 resolution from its IPS-technology panel. There is a 5ms G2G response time, 1000:1 contrast ratio, 1.07b colour depth, 178/178 viewing angles. FreeSync is also supported up to the maximum 60Hz refresh rate. Thunderbolt 3, HDMI 2.0b, DisplayPort 1.2 and 2x USB-type-C (one in and one out) connections are provided for connectivity. There are also 2x USB 3.0 ports, a headphone hack and 2x 3W stereo speakers included. The stand features a full range of tilt, height, swivel and rotate adjustments.